Since its founding in 1991, the Miami law firm of Jay M. Levy PA has consistently distinguished itself in the South Florida community, providing keen legal counsel, vigorous representation at trial and seasoned appellate advocacy. 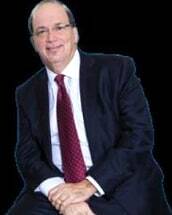 Founding attorney Jay M. Levy has been practicing law since 1976. For more than 20 years, he has also been board-certified in appellate practice by The Florida Bar. Among his extensive accolades, Mr. Levy has been named one of the top 19 appellate attorneys in the state by Chambers USA, listed in Florida Super Lawyers magazine every year from 2007 to 2015, rated AV Preeminent* by Martindale-Hubbell and listed in Best Lawyers in America. To schedule a consultation about any area of practice, contact Jay M. Levy PA. The Miami office is conveniently located in the Dadeland Centre II tower, near the Palmetto Expressway, U.S. 1 and Kendall Drive. Spanish language services are available/Se habla español. Attorney Jay M. Levy represents both corporate and individual clients involved in litigation arising from disputes over business transactions and business relationships.